Vertical Mount Unbreakable Cup Holder shown on vertical tubing support. Holder attaches to vertical tubing supports. Durable holder will not break. 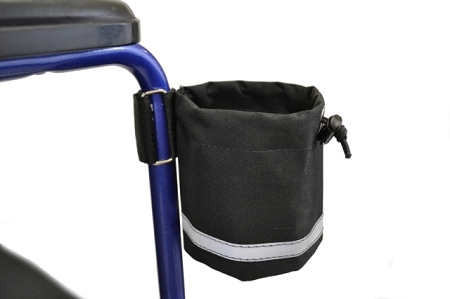 The Vertical Mount Unbreakable Cup Holder mounts to vertical tubing on a mobility device and is made of durable polyester fabric. 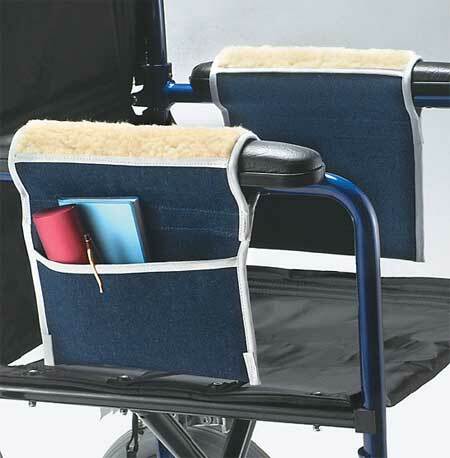 The wide adjustable strap securely attaches the cup holder on vertical tubing of a mobility device. This four inch wide cup holder accommodates drink containers ranging as small as 1 inch circumference all the way to large 32oz. bottles. 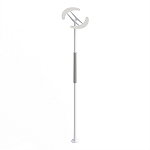 Mobility aid users will find this holder useful for carrying bottles, cups, beverage containers in a variety of sizes. A locking cord ensures that the container will remain secure and upright. The inner PVC lining holds in condensation and prevents dripping. On the front of the holder is a handy 2 x 4 inch fabric pocket for storing small items. 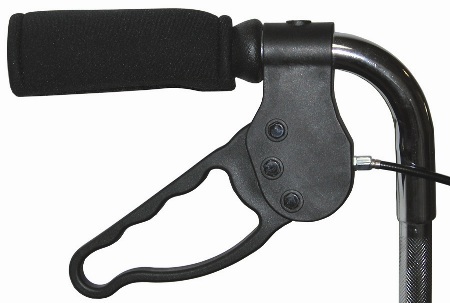 The adjustable velcro strap with D-ring secures the holder in place in the most convenient position for your mobility device. These cup holders are great. I bought them to put on my mom's transport wheelchair so we could carry water with us when we go out for a day. We will be using them in two weeks on vacations. 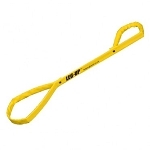 We did use it the other day on her walker and I was really pleased that it held tight. Smaller and less sturdy than I expected. I was frustrated with what I got compared to the write up. THE CUP HOLDER IS AWESOME, IT HOLDS ANY SIZE DRINK CONTAINER. 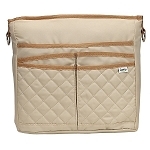 THE ONLY THING I WOULD CHANGE IS ADD A LITTLE PATCH OF VELCRO TO HOLD DOWN THE EXCESS FLAP AROUND THE OUTSIDE. This product is great! I mounted it on my power wheelchair and have used it almost daily since I received it. Prompt shipment of my items. I will return to this website to purchase items to help me with my disabilities and products that will help me with ADLs. 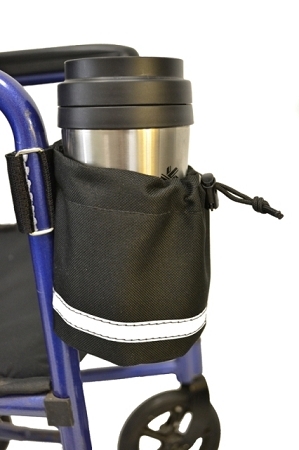 Q: Does this VERTICAL MOUNT UNBREAKABLE CUP HOLDER attach to the tubes of crutches? The other drink holders don't look big enough that are made just for crutches. Or am I wrong? They are big enough. 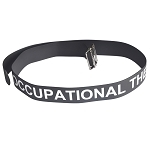 A: Yes, enough strap is included to use with crutches as well. You could potentially mount it to just about an vertical exposed tubing so long as the diameter is not much wider than a standard crutch/wheelchair. Q: My mother in law uses those styrofoam cups from like Sonic Drive In and McDonalds. How much weight can this hold? Looking up the info 32 oz is roughly 2lbs. A Route 44 drink from Sonic Drive In would be 2.8lbs when full. A: The manufacturer does not have a specific maximum weight rating. However, the taller the cup the more likely it will be to tilt/tip. Also, although they do not have a specific weight rating, the heavier you go the more likely the cup holder could slide down as well. I would not recommend using it with anything over a 32oz, which is what they did test with.